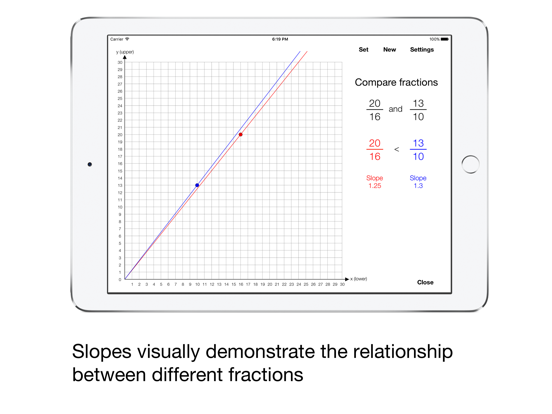 The Fraction as Slope app provides algebra students a new visual way to think about slope and fractions by showing how fractions are slopes. This provides an opportunity to increase conceptual understanding of both fractions and slopes. Students can explore, compare, add, subtract, reduce, and expand positive and negative fractions just by drawing and moving graphs of lines. "Fraction as Slope by Esa Heltula of iDevBooks is simply elegant. It is written for big kids with a design that respects and lends gravity to what they are learning. It does not have pizza pies or bears running through the woods in order to gather the correct numbers for a presented equation. 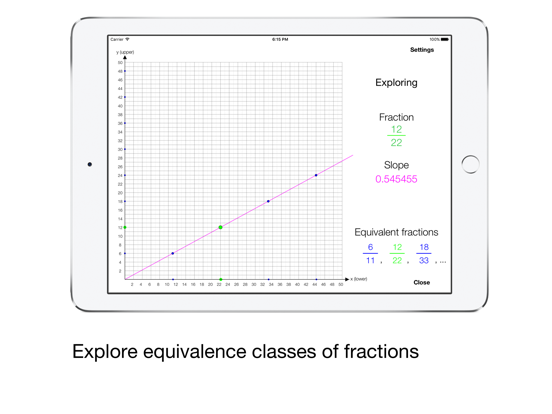 The app is simply composed of an adjustable grid where numbers are plotted along an axis so that you can visually SEE a slope of that fraction with all its equivalents, i.e. that 1/2 is the same as 2/4, or 5/10. AND that is what makes this so great. The replay value is simply genius in not only its layout and design for tablet use, but how fractions are presented in general. Visual learners can quickly get the skinny on fractions and by adding the kinetic component; it cements the concepts to memory. There are four sections with many options so that the app can be adjusted to provide the just right challenge over time. It is kid driven for open exploration, but still provides enough structure so there is a sense of completion and accomplishment. There are settings on both the home page and within each section that kids have access to at any time, if they want more of a challenge or to adjust the grid size. " 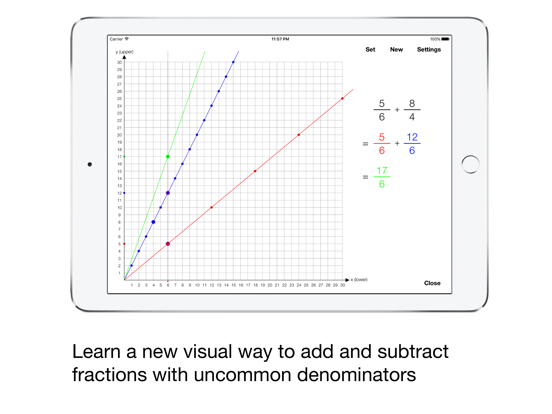 "Fraction as Slope allows your kids to play around with graphed lines and see the connection between fractions and slopes. 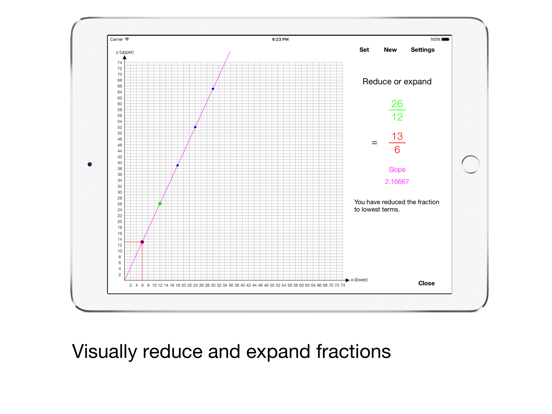 It’s a straightforward, targeted learning app, and kids will enjoy manipulating the graphs manually. All of Esa Helttula’s math apps are useful, clean, and focused. Each one targets a specific math concept, and I highly recommend all of them, depending on what part of math your kids are working on." iDevBooks math apps have been reviewed and endorsed by Wired.com, IEAR.org, and other other respected sites and organizations. Some of the 23 other iDevBooks math apps are Visual Multiplication Table, Visual Fractions Decimals and Percentages, Decimal Rounding, Whole Number Rounding, Column Subtraction, Column Addition, Long Division, Long Multiplication, Lattice Multiplication, Fraction Math, Partial Differences Subtraction, Partial Quotients Division, Partial Sums Addition, etc. Please give feedback or browse the 30 other math apps at idevbooks.com. 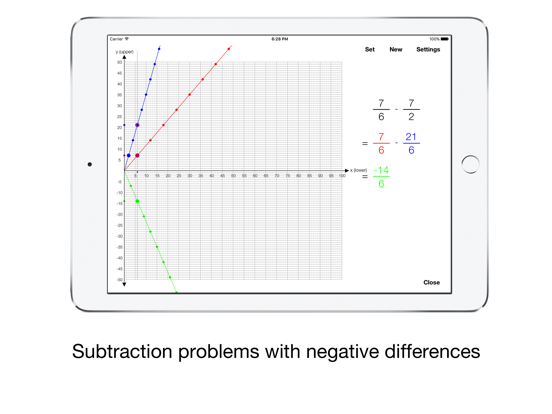 This app was very useful for my grandkids: it helps them to understand fractions.